A week before the events, the forecast had been for a mild Saturday. At last, a Cambridge event unencumbered with weather! By Monday morning, just 12 hours later, that forecast had changed to a revisit of cold weather from Scandinavia, dubbed The Mini Beast From The East — boooo! As the week progressed, the forecast got steadily worse, with Yellow and Amber weather warnings for wind, snow and ice in place across the country. Weather forecasts are a fairly blunt instrument, though, and institutional fear of another 1987 means both the Met Offce and the BBC tend to forecast worst-case weather — it's rarely quite as bad as they say it's going to be. On closer inspection, and by sticking one's head outta the window, it was possible to nuance the forecast a bit into "probably a bit of blown snow, but only small chance of ice" — warnings were duly sent out to all riders and the events to go ahead as scheduled. The one unavoidable truth in the forecast was the wind-chill — cold air and gusts of 40mph or so meant it would feel somewhat Arctic and riders were advised accordingly. 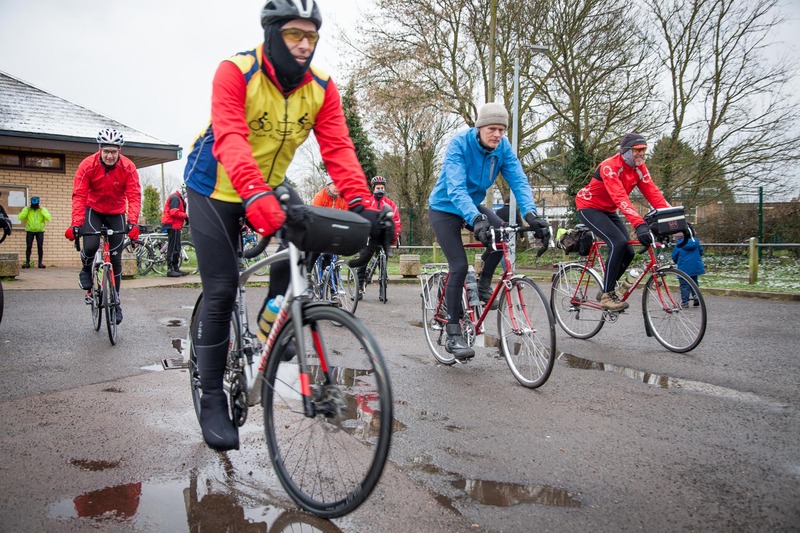 On the day, 40 riders set off on the Pork Pie, which was a little over a third of entrants. Definitely a tough day with that bitterly cold wind, the forecast snow in the end was just flurries and nothing serious — it was blizzard-like towards the far end of the course, but none of it was sticking, so the roads were fine. The final two back on the Pork Pie were still out as the snow started to settle and that was a concern, they rolled in at 11pm with the news that the route had been fine. One muddy descent on the Pork Pie was exactly where it always is, and advised in the briefing. One short snowy patch on the Spring Dash caused a few to question the rest of the route and B-road it around (and therefore just short on distance, missed the info, and not validated, but they enjoyed the cake at the end). But in the end it was all benign, merely a weather caution (yellow), not a warning (amber). The first rider back had rode the Classic in just over nine-and-a-half hours — about 45 minutes slower than the first back last year (who had ridden the EXTRA). FOUR riders successfully attempted the EXTRA route, even in those conditions, and third man back overall was one of those (about half an hour behind the Classic first-man-back). A fifth rider who attempted the EXTRA realised early on he wasn't going to make it around in time and abandoned. There were 11 complete abandons on the Pork Pie, with most riders opting to catch the train back from Oakham (in both directions), or from Melton Mowbray. Most abandons were due to "lack of legs", although a gear failure (and not enough humour to ride singlespeed on such a windy day) and a failed freewheel hub were also cited. And my favourite: one rider's routesheet was torn from their grip by a fierce gust on the return leg, and subsequent mis-routing meant they ended up towards Northampton, well off course, before calling it a day! Lantèrne Rouge came in at about 9pm, well within the time limit, but quite a way behind the bulge — the conditions tended to weed out those who knew they weren't going to make it and so had a fun day out before catching the train home. But let's not forget the two chaps who valiantly, but slowly, winched their way all the way back to Cambridge against that biting wind to successfully complete the course hors délais — chapeau! I marked their brevets as such and returned them as mementos. The Cambridge Pork Pie 2018 finishers' list here. 42 riders made it to the start of the Spring Dash, which was about half of entrants. 29 finished the course in time with one hors délais or 'beyond time limit'. The Tally Ho, Barkway, was the first pub and they laid on a mostly self-serve coffee-and-cake morning as I understand it. The fire was roaring in the grate and many riders defrosted for a few minutes before sorting out morning coffee. This is the third year we've used the Tally Ho and the owner has fine-tuned the layout to minimise queuing and get everyone served as quickly as possible, and I had independent feedback from many riders who were impressed with this arrangement. The White Horse Inn in Withersfield was a little less organised, as they had their regulars to attend to as well. 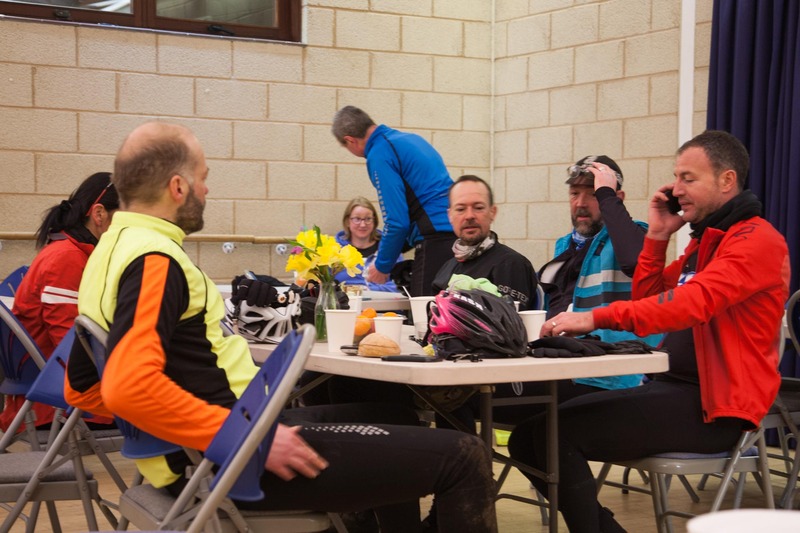 However, most riders reported they tried hard to make them welcome and another fire was roaring, so most stopped for more cake and tea before the final run back to Cambridge. At least one of those who bounced the control found it tough towards the very end as they started to run out of energy. The pub is under new management from last year and so I would hope they'll fine tune it for next year. A few riders also stopped at Bicicletta café con velo in Saffron Walden, but I haven't had a chance to speak to them yet. Most riders returned between 3pm and 4.30pm — the BP classification and lower speed requirement, plus two warm pubs, meant riders tended to hang around for a while before heading back out into the cold. A small group had avoided the potential for ice and returned early via a shorter route, but the first validated rider back was half an hour ahead of the rest at around five-and-a-half hours. Lantèrne Route was shared between two riders who came in after about eight hours Out There. It was a tough middle section directly into the teeth of the gale! So a third of all riders failed to complete the course, with four deciding the lanes may be icy (which was incorrect) and opted for an alternative B-road bash that shortened the route and missed the info, but were then first back. And eight true abandons with riders returning via the shortest main-road route from where they were back into Cambridge — a mix of cold, fatigue, illness and mechanicals (another broken gear shift and another temperamental freewheel hub). The Cambridge Spring Dash 2018 finishers' list here. Everyone back or accounted for. A few "hors délais" — "beyond time limit" — but brevets signed and returned (but not validated). On reflection of both pre-ride forecast and in-ride actuality it was the correct decision to go ahead with the events. Those who chose not to ride did so because they were not comfortable with the forecast conditions and personal risks — and most spoke of the potential for ice, rather than just the wind, and I rated the cold (temp – windchill) to be the greatest risk with the potential for hypothermia; the ground was too warm from Friday for ice to form until late into the evening. Many riders struggled to sort their brevets and receipts out as they finished until their fingers had warmed through and I had to remove the gloves off one! Those who did ride, many found the wind too much for their legs and abandoned safely — roughly one-third abandoned, so a tough day, but that underlines the audaciousness of those who went on to finish. Lantèrne Rouge on the Pork Pie was a Cambridge rider with whom I've ridden the Extra in 12 hours (and he had to wait for me on the climbs), so would normally be ahead of the bulge on the Classic, but found himself alone pushing into the wind at 15kph on the return — underlining the difficult windy conditions. 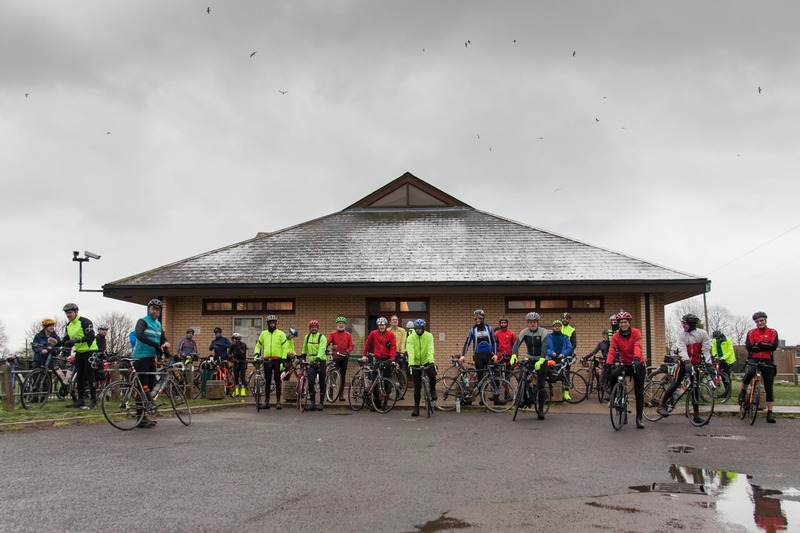 Note that some riders were due to drive to the start from areas affected by significantly more weather than we experienced on these two events. They had no choice but to DNS, as it would not have been at all safe for them to drive in the conditions, regardless of the windy-but-benign weather we had during the day.